Without question, A Fisherman’s Tale is a beautiful game. While the entirety of the game takes place within the enclosed confines of a lighthouse and the adjacent shanty, there are some visual moments in A Fisherman’s Tale that were so stunning, I felt my breath skip. The ways that the game plays with scale inspire a feeling very close to awe, and the depth that is packed into the seemingly simple story is audacious. There is a great deal to recommend in A Fisherman’s Tale, but in its current condition, I hesitate to endorse the game in its entirety. Unfortunately, pervasive technical issues hold back what could have been a hidden pearl of a game. A Fisherman’s Tale: To infinity…and beyond! 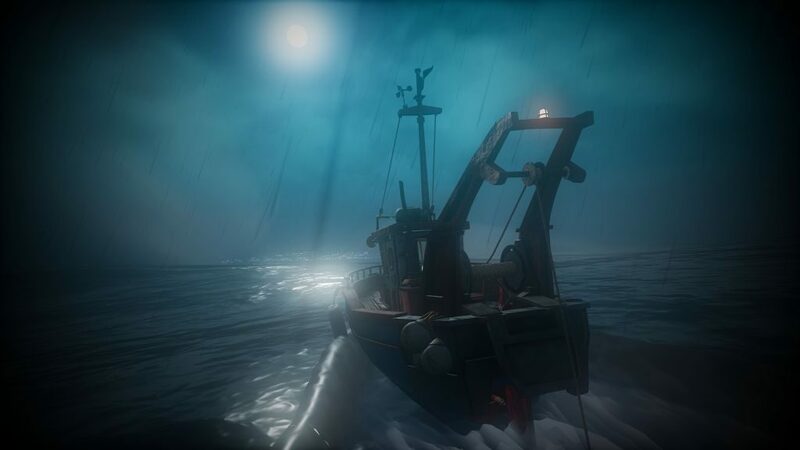 There is a feeling of melancholic wonder that persists throughout A Fisherman’s Tale’s two hour playtime. 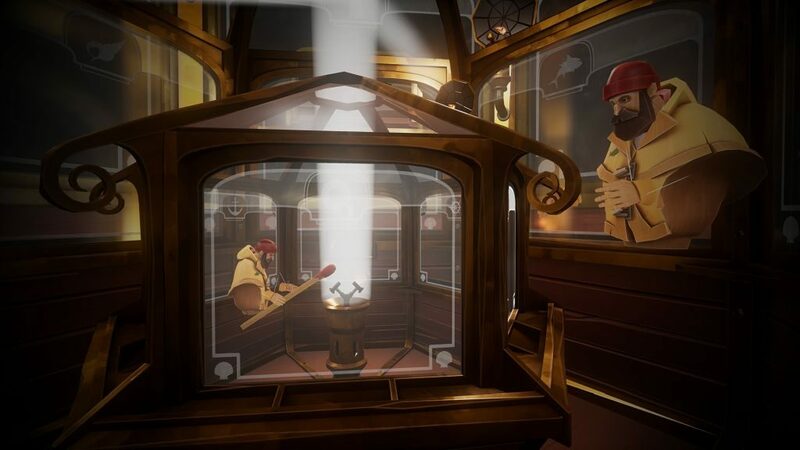 The player takes on the role of a lighthouse keeper, who awakens and goes through his morning routine, only to discover that – though the day appears to be crisp and bright – a storm is brewing out at sea. The lighthouse keeper must make his way to the top of his tower to light the lamp, shining a beacon so that wayward ships can find their way home. In the center of the lighthouse keeper’s modest living space is a tiny replica model of his lighthouse and shanty, which he works on every day. Every object, every shadow in the shanty is reproduced in the model in fascinating miniature. 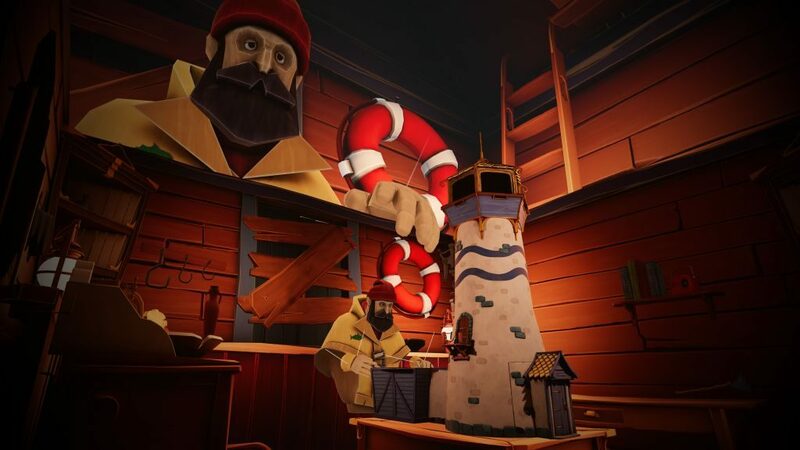 The game takes a twist into the surreal when it is revealed that the lighthouse keeper is not human at all, but is merely a wooden puppet, and he himself exists in a model of the lighthouse. Standing above the model and peering inside, the lighthouse keeper can see himself in miniature, standing above an even tinier model, peering down at an even tinier lighthouse keeper. Looking up, the lighthouse keeper can see a gigantic version of himself, who is in turn looking up at an even larger version. There is a bizarre recursive loop at play, and due to the storybook nature of the game, very little explanation is offered or needed. There doesn’t seem to be any end to this loop of lighthouses and shanties. It is just turtles stacked on turtles, all the way down. Though the mind reels when considering the repercussions of your place in this infinite chain, things become much easier to manage when you decide that you need only concern yourself with the layer above and the layer below you. All of the levels in the lighthouse loop share the same physics. If you pick up an object and move it within your iteration of the shanty, a tiny version moves inside the model, and a giant version moves in the shanty iteration outside your own. At first it is enough to make your head swim. The sight of giant objects floating through the air is stunning. The real mind-bender comes when the player realizes that they can change the size of objects by chucking them between layers of the lighthouse iteration. For example, if you have an item that you need to shrink, pick it up and heave it over the wall and into the larger version of the lighthouse. One of the game’s more satisfying puzzles…and one of the least frustrating. This will result in a tiny version of you tossing a tiny version of the object out of the model lighthouse. Pick it up, and voila, you have a smaller version of the object. This dynamic works in reverse, of course. Drop an object into the model, and a giant version will come crashing down into your layer of reality. A Fisherman’s Tale finds many playful ways to harness this dynamic, creating a number of clever (and not overly difficult) puzzles for the player to solve. The game is structured like an escape room game, but the additional layer of size manipulation adds a fun wrinkle to the proceedings. A Fisherman’s Tale: Iceburgs ahead, captain! The difficulty comes when the player discovers that the physics model the game uses to handle objects is unstable. 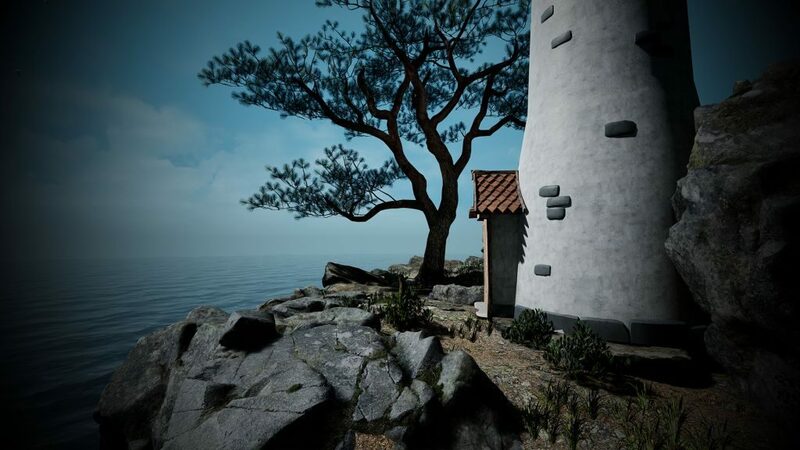 The way A Fisherman’s Tale handles objects is downright temperamental. For a game that requires players to manipulate any number of objects carefully in an enclosed environment, having these objects simply disappear from your hands is frustrating at first, infuriating by the end of the game. Each of the game’s four chapters are self-contained puzzle rooms, requiring the player to carefully gather various items and manipulate them within the game engine’s charming puzzle mechanic to succeed. However, the simple act of keeping an object in your grip is almost impossible. When moving about the shanty and lighthouse, if you accidentally bump into…well…anything, the object in your hand is sent flying in some random direction, almost faster than your eye can follow. Oftentimes, the object lands somewhere out of sight, or inside another object where it is inaccessible. If you wait long enough, the object will eventually return to its position of origin. But when you are continuously accidentally sending things flying, waiting for the objects you need to succeed to reappear gets old, fast. In the opening chapters of the game, this object-tracking issue is a frustrating barrier to forward momentum. But in the later half of the game, fine motor skills are required. Careful manipulation of objects through several iterations of the lighthouse are needed for success. There are few things more maddening in a puzzle game than figuring out what you need to do, and not being able to do it. Not due to a lack skill, but because the game is abjectly refusing to cooperate. The last puzzle in the game contains some Goat Simulator levels of jank, and it breaks my heart, because I otherwise loved this game. Regardless of the technical issues, A Fisherman’s Tale contains a wonderful story. Though it never delves so deep that younger players might get lost, the storybook tale still manages to touch on a variety of thought-provoking themes. Much like the surface of the sea, there is little way to measure the depth of the themes that reside beneath the surface. How deep you want to dive is entirely up to you. Issues of identity, individuality and free will. The need for a parent’s approval, and the scars that appear on one’s soul when that approval is withheld. The differences between our perception and reality’s true nature, and how sometimes it is necessary to cut through that barrier. Depression and isolation, and how one startling event can sometimes break people from the emotional prisons that bind them. 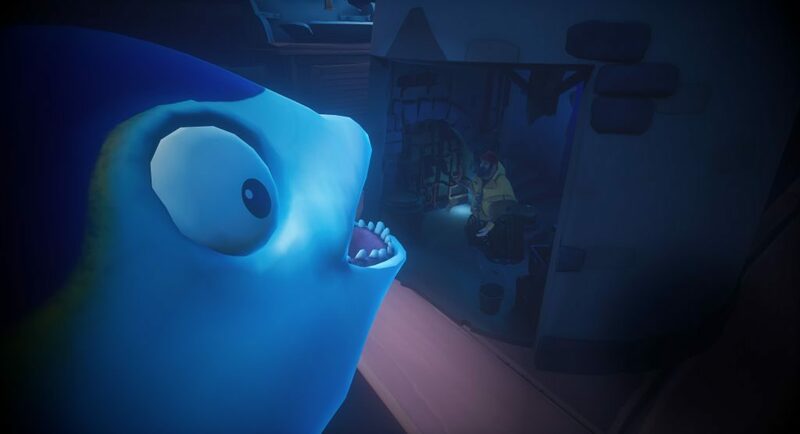 Rather than constructing a simple story, the developers at Innerspace have constructed a resonant fable, which at once feels familiar and timeless. And despite all of the technical glitches, there are moments of mystery and splendorous surprise tucked into this experience. The sea is lovely, dark and deep. And terrifying. And lurking behind it all is the sea, a character in the story who never speaks. The sea is represented so well in A Fisherman’s Tale that I could almost smell the briny air. I immediately began wishing that someone would make a pirate game for PlayStation VR, as the sea has such depth and life in A Fisherman’s Tale that it almost feels real. Though there is a romanticism at work here, the sea can be frightening during a storm, and A Fisherman’s Tale does not shy away from that. In the end, A Fisherman’s Tale is a conundrum. A beautiful game that doesn’t play well, with clever, accessible puzzles that are next to impossible to solve, even if you know what to do. A remarkable, charming story, told in a brief story-book manner that only hints at its actual depth. 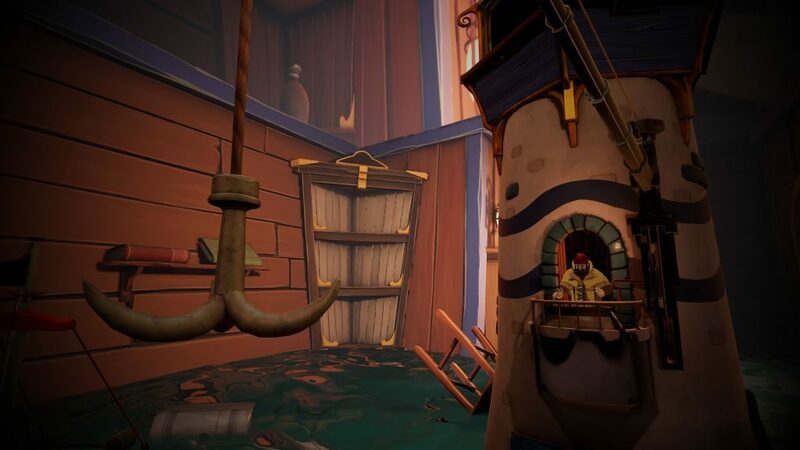 It is entirely possible that the issues in A Fisherman’s Tale could be patched out, which would send it immediately up to a higher range in review scores. But as it stands, I can’t recommend this game, as much as I might personally love it.